Expanding preclearance operations was discussed when Canadian Prime Minister Trudeau visited Washington. The Canadian and U.S. governments reached an agreement about preclearance in March 2015. Bipartisan bill is step toward solidifying the existing agreement between the U.S. and Canada on preclearance. Bipartisan legislation to facilitate travel and commerce between the United States and Canada was introduced earlier this month in both houses of the U.S. Congress. The Promoting Travel, Commerce, and National Security Act paves the way for expansion of preclearance facilities, operated by U.S. Customs and Border Protection, at land, rail, marine and air ports of departure in Canada. Expanding preclearance operations was on the table for further discussion when Prime Minister Trudeau arrived for the first state visit to Washington by a Canadian leader in two decades. The two governments reached an agreement about preclearance on March 16, 2015 and the bill introduced Tuesday is a necessary step toward solidifying the agreement. The bill was introduced in the Senate by Senator Patrick Leahy (D-Vt.) and Senator Lisa Murkowski (R-Alaska). Bipartisan companion legislation was introduced Tuesday in the House of Representatives, led by Representatives Elise Stefanik (R-N.Y.) and Annie Kuster (D-N.H.). The United States currently operates preclearance facilities at 15 airports in six countries, including Canada. These facilities allow travelers to pass through CBP inspections prior to traveling, expediting their arrival in the United States, and protecting national security by identifying individuals who represent a threat to U.S. national security before they depart foreign soil. Under the new agreement, the United States will expand its preclearance operations in Canada, which will include rail preclearance facilities for the first time. The Leahy-authored legislation is a necessary prerequisite to full implementation of this agreement, and therefore to the benefits of expanded preclearance operations in Canada. “In Vermont, we look to our Canadian neighbors as partners in trade and commerce, and as joint stewards of our shared communities,” said Leahy. 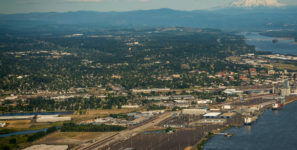 The Pacific Northwest Economic Region (PNWER) applauded the bipartisan introduction of the legislation, saying it will streamline commerce and travel between Canada and the United States.